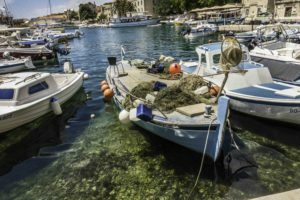 Our cruise started from Riva harbor in Old Town, Split, Croatia so our planning included a few extra days for exploration before departure. 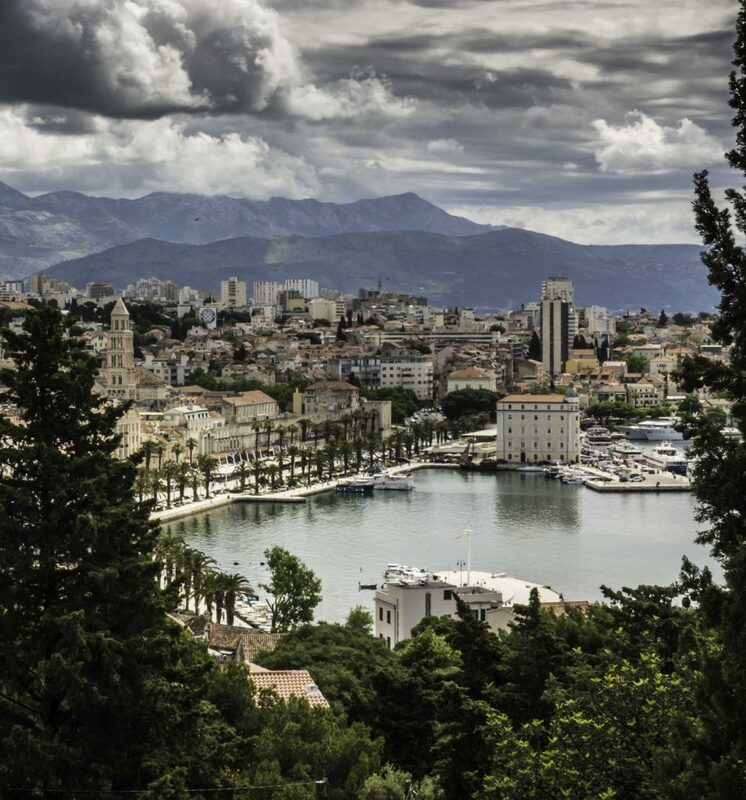 From San Francisco to Split, Croatia is 6300 air miles. 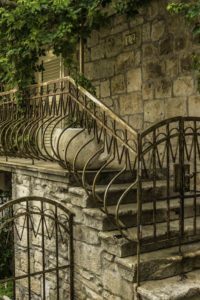 We chose to break it up and take advantage of airfare discounts by flying to London Heathrow round trip, then booking a separate ticket on Croatia Airline to Split. After stretching our legs walking from Terminal-3 to Terminal-2 in a short layover, we dropped bags and checked in with Croatia Airline. Departing at 5 P.M. from San Francisco we arrived at 9:30PM the next night in Split – long flights. We had read online that Croatia Airlines has an affordable tour bus meet their planes and drop passengers at the bus depot in Old Town, about 35 minutes away. After a bit of searching we found it on the upper level road just outside the terminal. Arriving so late, we hoped restaurants were still open. Foolish us, it being Saturday night the Old Town was just getting started when we arrived at 11 P.M.
Split is the second largest city in Croatia and Old Town on a Saturday night is the venue for a parade of finely dressed, attractive young women in heels, with gawking young T-shirt clad men lined up bar-side along the parade route. We found an open-air restaurant and sat down in the comfortable 70°F weather to enjoy a quick repast. Jet-lagged and not really hungry, after a quick dinner of appetizers, a “Greek” salad and a fine Croatian wine (2017 Vinarija Pilač Zlatarica) we still had time to view some of the Old Town before retiring at 2 AM. Within the palace walls are the ubiquitous tourist gift shops, fast food pizza restaurants and ice cream vendors, but by exploring some of the off-the-beaten path back lanes in the Northern part of the palace, (the former Roman soldiers quarters,) we found two fine restaurants: Uje Oil Bar and Bokeria. 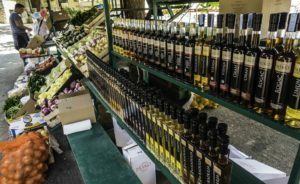 Both featured local fresh seafood, Croatian wines and a remarkable range of local olive oils. In Uje Oil Bar, we found fresh swordfish, caught that morning, and made a reservation for dinner. Lunch at Bokeria, was wonderful homemade soups and salads with good local Croatian wines, making us decide to reserve for dinner the following night. Good food and fine wine at affordable prices, things were definitely looking up. Croatia recently joined the European Union, but other than European tourists, we found little evidence of EU-nification. Instead, the locals were friendly, World-cup soccer-crazed, proud and very nationalistic, i.e., preferring the Croatian Kuna to EU currency for all transactions. 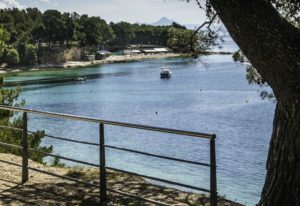 While Croatia is definitely on the EU travel map, we didn’t encounter many US or Asian travelers. Marjan Park (Park Suma Marjan) is a pine forested viewpoint perched on a hillside peninsula Northwest of the city. 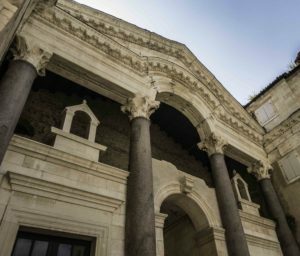 The commanding views of the Old Town palace and the Riva harbor made it a must see. The park is accessed by a steep many hundred-stairs walkway to the top of the hill (584 feet in altitude.) The quick half hour walk left me a bit winded, but the views were even more breathtaking. At the top of the hill, past the little 13th century church of Saint Nicholas the Traveler and the meteorology observation post, (Hidrometeorološki opservatiorij,) numerous trails fan out into the woods. They provide easy walking to pristine beaches, the 15th century St. Jerome (Sv. Jeronima) Church and Renaissance hermitage caves. The park is ideal for a quick workout, (on jogging trails,) hikes or just a leisurely picnic. There is a small terrace coffee/tea shop near a viewpoint about halfway up the hill. It offers a welcoming respite and refreshments with good views of Old Town and the port. For those not athletically inclined, a taxi can get you to the top of the hill and it is a leisurely walk back down. 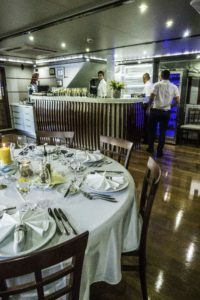 Boarding our 19 cabin cruise ship, our bags were whisked away and we were transported into four days of effortless luxury with fine dining, good wines and great service. In port each night for a good night’s rest, with dinner ashore or on-board, after breakfast each morning the engines started and we were off on our voyage of exploration to a new island. Lunch found us at a small get-away island for a swim break and by mid-afternoon we were at our next ancient cobblestone port ready for exploration. With long days, our pattern was to dine late but all the locals also seemed to be on that schedule with most shops and restaurants still open at 11PM. En route to Croatia, while waiting for our Croatia Airlines plane at Heathrow airport in London a fellow passenger with a strong Australian ascent asked where were going. 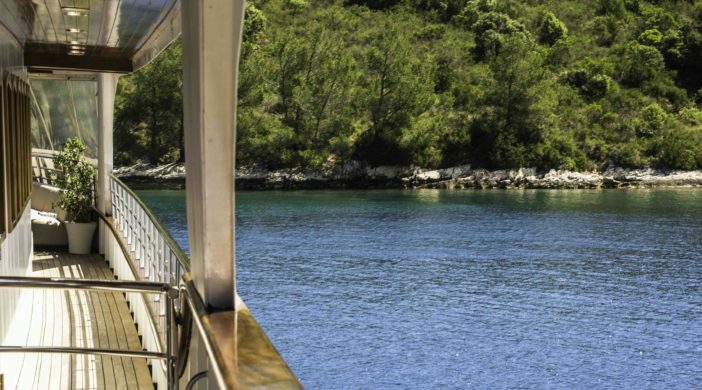 “On a Croatian Islands cruise including Brāc, Havar and Korkula,” I told him. He corrected me immediately, “Korkyra is the ancient Greek pronunciation, we say phonetically, Brahc, Var and Kochula.” It seems that when he graduated from the University of Zagreb with a degree in electrical engineering, the only jobs available to him were in Australia, so that’s where he and his wife have lived for the past 38 years. 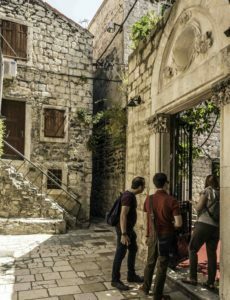 Now retired, they were returning to their ancestral home on Korčula. With the civil war, upheaval and turmoil in Croatia, many records were lost and he was finding it difficult to prove his birth rite and citizenship. The verbal picture he painted of his pine forested island with its ancient Illyrian, Roman and Greek BC settlements were all so compelling we felt eager to explore. 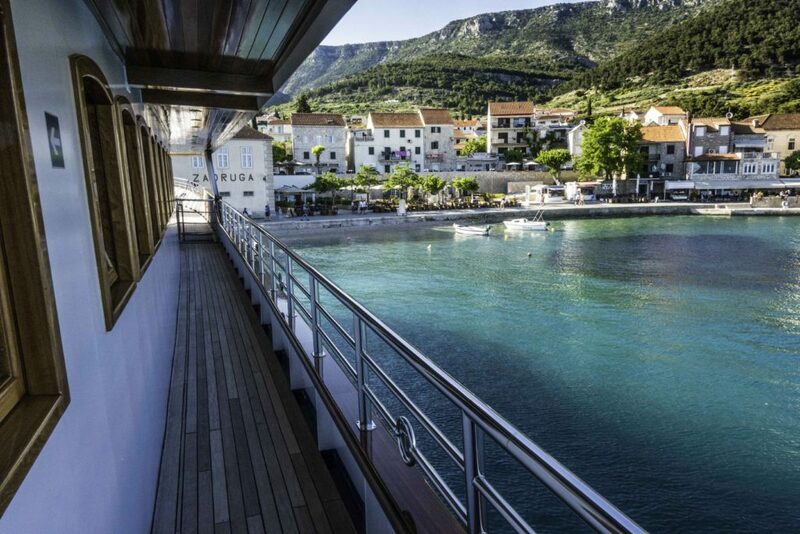 When our cruise ship pulled into the beautiful Venetian harbor at Korčula Old Town, we weren’t disappointed. Hoop skirt to fit the historic railing? 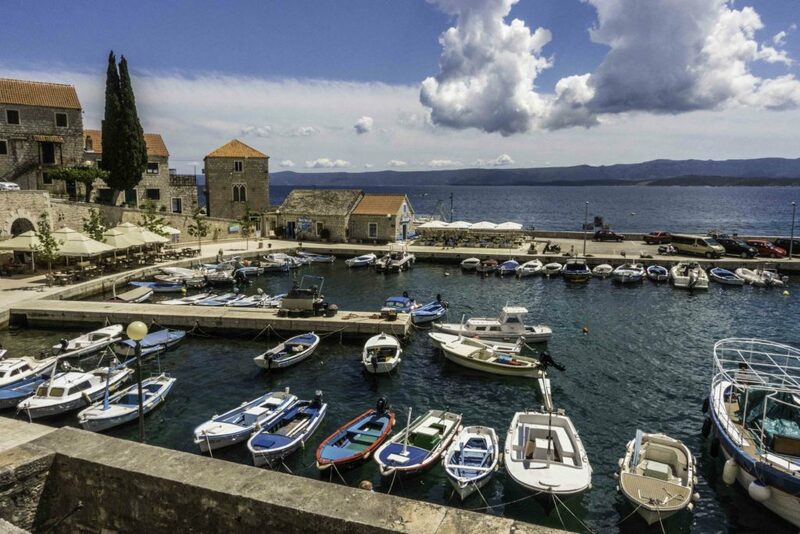 Korčula, the first port on our Croatian island cruise, claims to be the birthplace of Marco Polo. Commanding a Venetian galley, he was captured by the Genoese navy at the Battle of Curzola off the coast of Korčula. While in prison, he penned the account of his mercantile travels to China. He would probably still recognize the narrow cobblestone stepped lanes and compelling 9-12th century Venetian fortress. 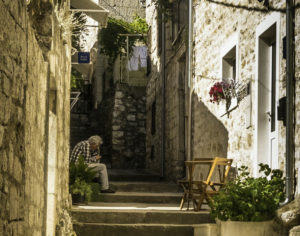 We found many small cooperative arts shops and cafes featuring quality works from local and resident young island artists including some from Bosnia and Slovenia. 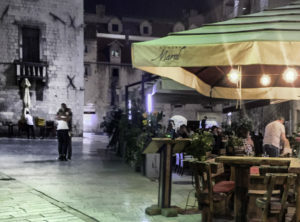 Korčula is also renowned for its fine white wines. Uncrowded and lazy, it was the perfect place for some fine wine tasting, sunset watching and a quiet romantic dinner ashore. We thought of our Australian emigre and hoped he and his wife were now reunited with the rest of their family; ensconced in their ancestral home. 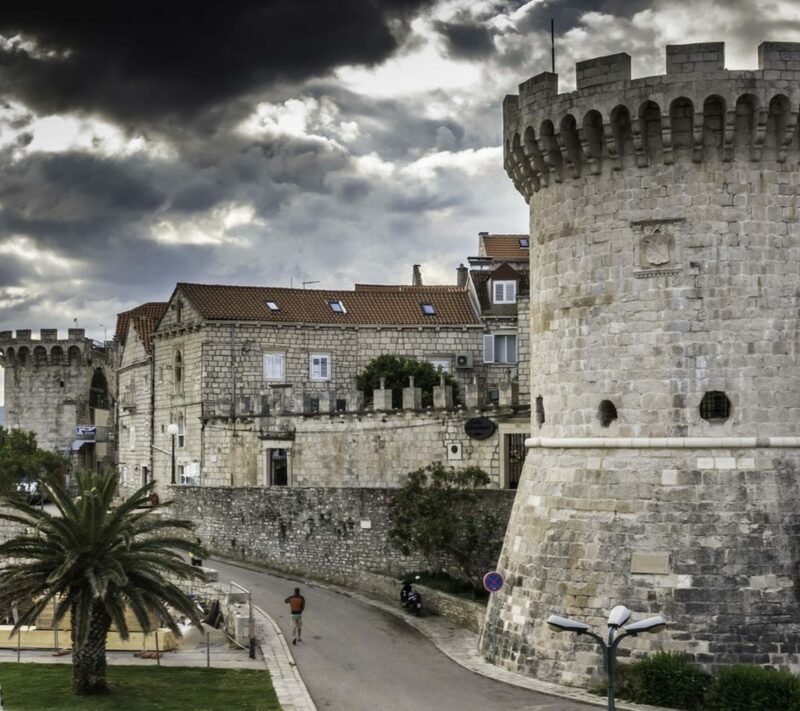 After a peaceful night under the lights of the Korčula Venetian fortress, breakfast found us departing under a grey and imposing sky with distant black rain squalls dotting the horizon, and rainbows and large cumulus storm clouds nearby. We were definitely in for a change in the weather. 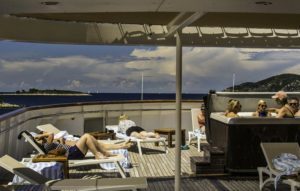 Standing on the upper “sun-deck” after passing through a patch of rain, I wondered if our afternoon in Hvar would require rain gear. A polite member of the crew volunteered that rain in the morning was common but it would clear. 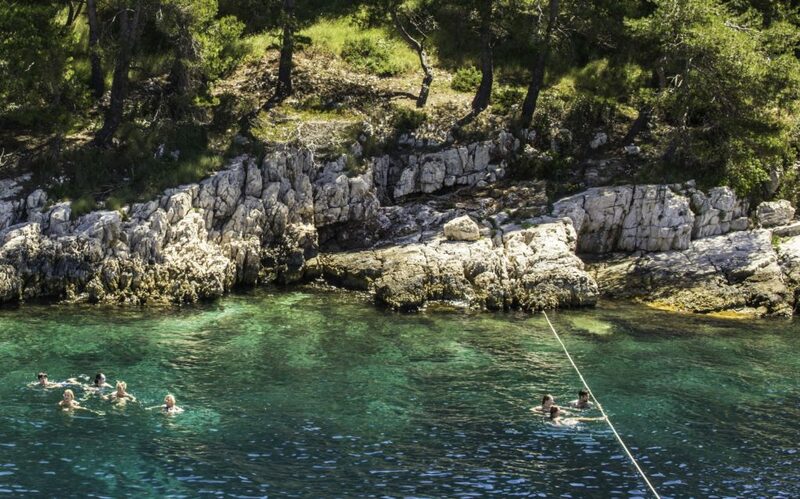 Sure enough, by noon it was bright, sunny and warm for our luncheon swim stop at a small island within sight of the second port on our Croatian island cruise, Hvar harbor. With a May water temperature in the 60s F, swimming is bracing but the clarity of the clean turquoise water can’t be beat. 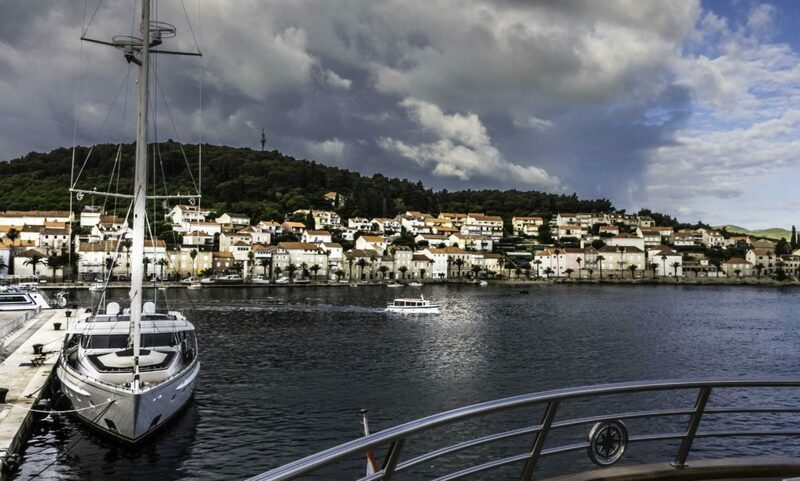 Hvar Town, on the island of Hvar, has an ancient history as a Venetian stronghold and 13-14th century administrative center. 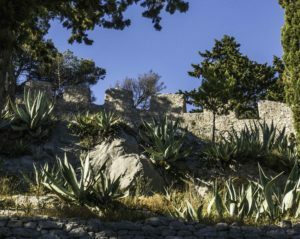 The fortress of Fortica/Spanjola on the hillside is one of the most imposing in the Dalmatian islands. For us, it was a wonderful hike from the harbor. Winding to the top of the old town cobblestone lanes, a small flight of stairs led us to an inviting path through a botanical garden pathway to the fortress. The garden was evidently planted in the 1920s. Now mature, giant palm trees line the pathways and huge yucca grace the hillsides between local olive, pine and cypress trees. Views of the harbor and distant islands were increasingly beautiful as the town receded and the hilltop fortress grew larger. The view from the top of the fortress was well worth the small entry fee. 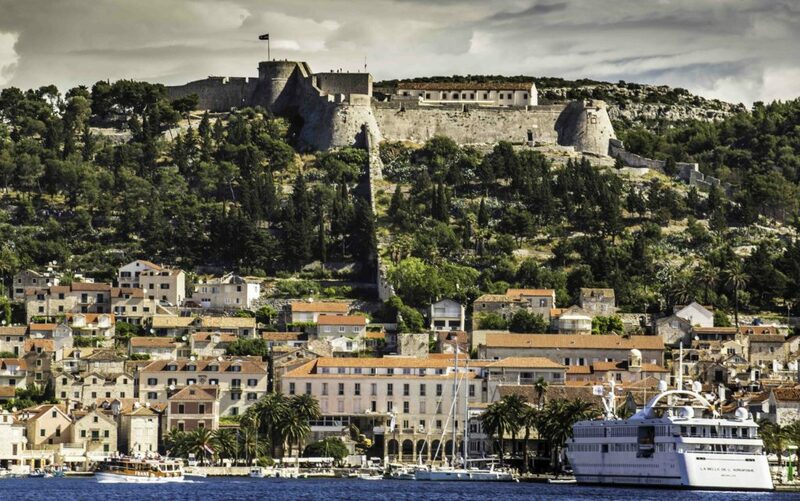 Over the ramparts lay an unobstructed view of the old harbor and distant Dalmatian islands. The walk down being much less demanding and faster, we were ready, and in time, to meet shipboard friends for a fresh fish dinner at a restaurant near our ship in the harbor. 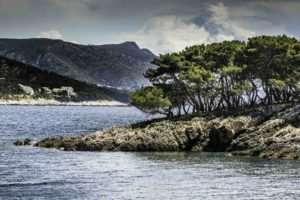 Departing from Hvar in the morning gave us another view of the island’s vineyards, rocky shores and small pristine pocket beaches. Mid-morning we anchored off the beautiful Golden Horn (Zlatni Rat) beach a short walk from the town of Bol on the island of Brac. Opting to explore, rather than swim, we jumped into the Futura’s Avon tender and were ferried ashore. A short walk on the beach found us at a beautiful tree lined walkway to Bol; and half an hour later, we were there. With no cruise ships yet in port and not a tourist in sight at 11 a.m., we had the beautiful ancient harbor to ourselves. 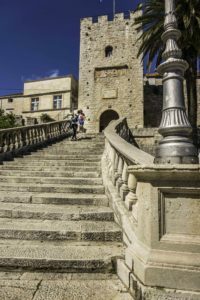 Brac is the island from which the Romans quarried limestone and marble for Diocletian’s palace, but there was still more left for the Venetians when they built the little Bol harbor the 13th century. Walking, we visited the fresh food market (multitudinous kinds of olive oil), Stina winery tasting room (dating from the early 1900s) and the 1694 A.D. Venetian Renaissance palace which is now a museum of Croatian art. Shopping and looking made us late for returning to our ship, so we caught an inexpensive water taxi back to the Golden Horn beach. A short time later our ship left and pulled back into Bol harbor for the evening. After an appetizer tour and tasting at the Stina winery, our onboard chef Jorge showed his amazing talents with a white table cloth 5-course Captain’s dinner. 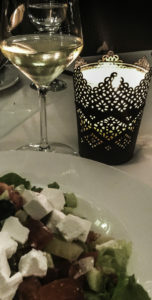 Served with fine wines and accompanied by a good local keyboard/guitar duet playing popular rock music with a few Croatian tunes thrown in for good measure, we felt well and truly spoiled. 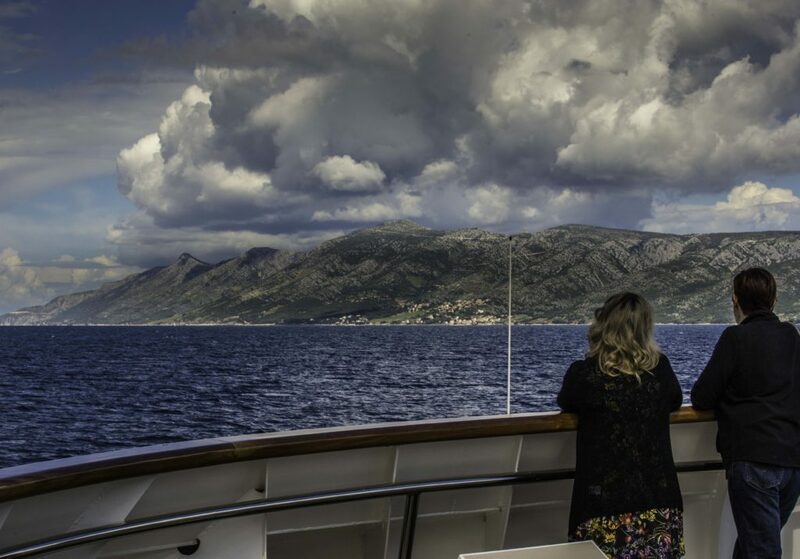 Like all wonderful and great things, our Croatian island cruise had to come to an end. Sadly, morning found us back in Split’s Riva Harbor departing for our flight back to London and reality, but with beautiful memories and longing to do it all again – and soon. What more can be asked of a short week cruise vacation? 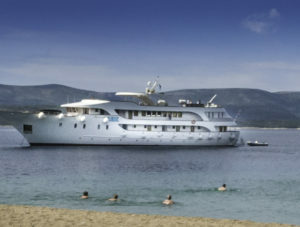 IF YOU GO: Katarina Lines has seventy six ships to choose from with different Dalmatian island itineraries and levels of service to fit the budget, i.e., from “Deluxe Superior” (nine ships including the “Futura“) to “Traditional.” We booked direct with Katarina Lines at their online site and were very happy with the arrangements. Airfare competition from the West US Coast to London Heathrow gave us an opportunity to fly at a discounted rate to the UK. From London, we booked separate round-trip tickets on Croatia Airlines to Split. That made the total airfare very affordable. Paying in Croatian Kuna rather than Euro, the local accommodations, food, wine and shopping were affordable. Croatia was a fine wine exporter for many centuries BC and is the genetic home for California strains of Zinfandel. 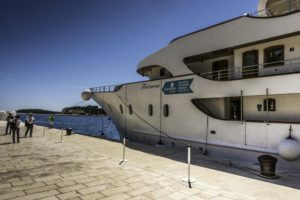 For wine tasting in Brac, Hvar and Korcula, see the companion article on this site “Croatian Wine Tasting in the Dalmatian Islands“. For more information on Croatian wines visit: Croatian Wine, Hvar, Brac and Korčula on Wikipedia; the Hvar winemakers website; Paul Bradbury’s Hvar news blog and Croatian wine articles blog, e.g. 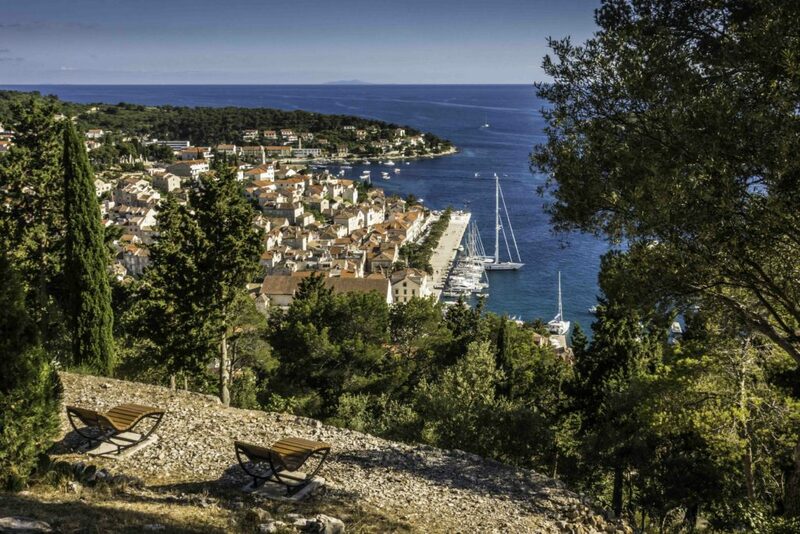 “Hvar Island Wineries: A Touch of Class”. For bicycle and other winery tours on Hvar, see the Hvar Wine Tours website.